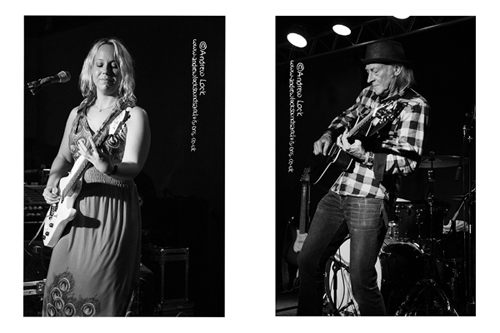 Chantel McGregor / Del Bromham , Zephyr Lounge. Leamiington Spa 6/9/14 - One of the true gentleman of the blues and rock scene Del Bromham stepped in at short notice with a one man performance to start the evening in style with a set comprising material from his solo albums, numbers from his hard rock outfit Stray and a couple of blues covers. As entertaining as always with his banter and good humour (as well of course a top vocalist and guitarist to boot) his set including his tribute to a certain well known beverage 'The Ballad of JD' and the upbeat, happy-go-lucky 'Nine Yards'. Chantel chose this gig as a testing ground for new material which went down a storm, she calls this her "new era" and this new era rocks especially on the high octane numbers like the ferocious 'Burn Your Anger' and 'Lose Control' while on the softer side her new offerings included an emotional tribute to Jeff Buckley on the sublime 'Eternal Dream'. Plenty on offer from her cracking debut album 'Like No Other' including the powerful title track, the beautiful and emotional 'Screams Everlasting' and the knockout encore of epic rocker 'Freefalling'. A young lady with breathtaking talent and many awards to her name, she has an incredible guitar style, a beautiful vocal tone, a quality drummer and bassist alongside her and a perfectly natural humble charm that has the audience eating out of her hand while the mix of full on rock material with interludes of gorgeous laid back pieces works so well.